One of my favorite indicators is John Bollingers, Bollinger Bands. They’re an amazing and excellent volatility indicator and one of the only other on-price indicators that I use in conjunction with Ichimoku charts. 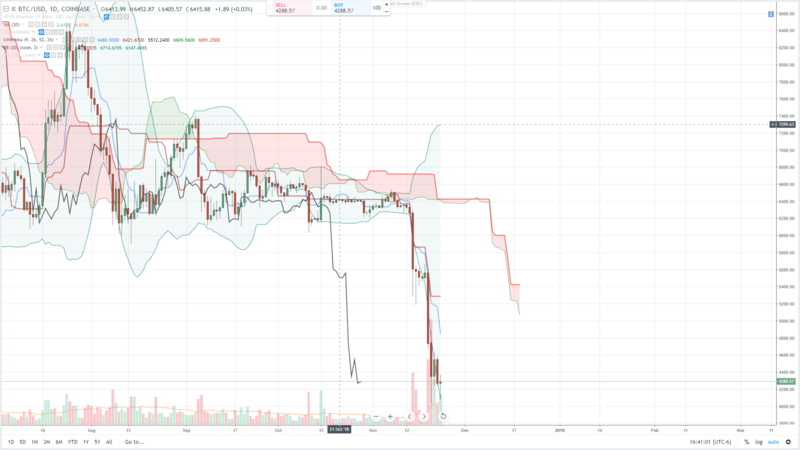 One of the most conservative buy strongest signals in the Ichimoku system is waiting for both price and the Lagging Span to move outside the cloud. 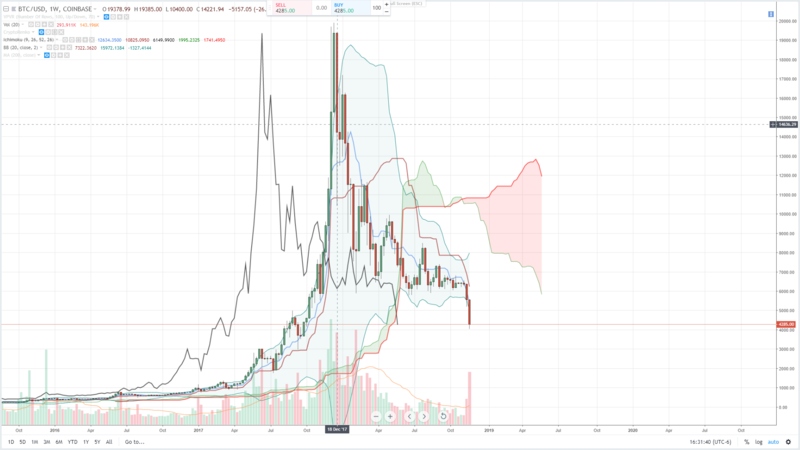 We have one of those signals on the current weekly chart (which doesn’t actually close until Sunday) with the Lagging Span below the cloud and price below the cloud as well. However, the cloud that the Lagging Span broke through is mostly moot. Thin clouds do not represent strength and traders should not put much stock (pun not intended) into the break of a thin cloud – especially on a weekly chart. I also have the Bollinger Bands on the screen to show that we have left the squeeze that we have been in since the major contraction from the week of October 15th to the week of November 5th. I would recommend people be very wary if they are short. On a long-term time frame, we have a fairly long consolidation phase after a massive bull move – the exact behavior that price is exhibiting on the weekly chart is one that precedes major expansion moves: massive volume out of a squeeze and breaking down outside the Bollinger Bands. The constriction and squeeze of the Bollinger Bands is even more evident here on the daily chart. The squeeze between the dates of November 5th to November 12th is one of the tightest ranges on the daily chart in the entire history of Bitcoin. We can see the breakdown outside the Bollinger Bands and how sustained that move was. But we’re seeing the end of that down move and evidence of the false break. In fact, on the Friday daily chart, we see the first daily candlestick that will close within the Bollinger Bands in almost two weeks. We also see that price is a significant distance from the baseline, which is the 5300 value area. And the cloud ahead is extremely thin, making it easy for price to return to the 6k and ultimately the 8k value area. The 4-hour chart is showing a strong bottoming pattern and the kind of slingshot maneuver we can expect. The setup here at the bottom of the Bolling Bands is screaming reversal. 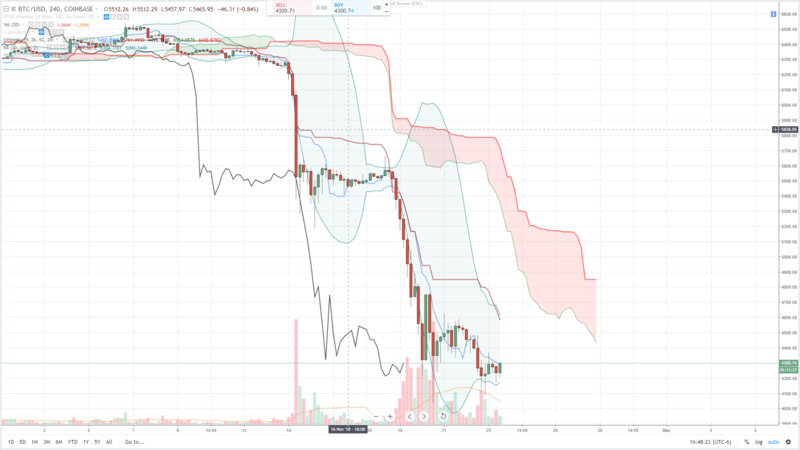 We can see price is clearly below the cloud on all time frames and we’re seeing another attempt to push higher. Traders are certainly probably frustrated with the move in Bitcoin this year, especially because the entire year has been a consolidation pattern followed by a move no one wanted to see. However, we want to see this kind of move out of a consolidation zone – especially if we want to see higher prices.